WFN: On the women's side it appeared to be a great addition, adding significantly to the event. Tony Woods: Absolutely and on a whole range of levels. Hopefully we can build on the number of women teams for 2014. WFN: If there was one downside it might be the lack of competitiveness of the Australian indigenous and multicultural side. Did the AFL misjudge the international teams when selecting the AIM squad, or are we missing the point of it? My assumption was that the team was picked to promote the game in those communities and not dominate the tournament, but still provide good competition. Tony Woods: I didn’t see it as a downside. It was a great opportunity for young indigenous and multicultural women to participate. It was always going to be difficult striking the balance between building a side that gave an opportunity to play and being competitive enough. And this shouldn’t detract from the girls involved - I thought they competed to the best of their ability against some pretty strong opposition. WFN: There's a lot of quality indigenous and multicultural women playing footy in Australia, do you think this concept will be repeated in future, and if so do you think there will be a focus on making it stronger? WFN: The official events associated with the tournament seemed to be bigger than before, with the opening night at Luna Park in Sydney, the morning tea at the Prime Minister's Sydney residence, Kirribilli House, the closing function at Crown Palladium, as well as a visit from the Victorian Premier. Pulling all of those together must've been pleasing and helped raise the profile. But still, the mainstream media seem a little reluctant, were you happy with the overall coverage? Tony Woods: I thought the overall coverage was excellent particularly the Sydney component. The reality is the International Cup is an emerging event with amateur participants from developing football nations, and it is competing within the midst of the AFL season. I think we have come a long way since its inception and it will continue to build in profile. WFN: On a personal note, it was your first International Cup since taking up the International Development Manager position. I don't think you'd seen the previous Cups. How did you find the whole experience? Was it what you expected? Was there a personal highlight, besides perhaps the primary goal which is always to make sure all the nations turn up? Tony Woods: There were several – the spirit in which it was played, feedback from a variety of sources that the standard continues to improve, the different cultural interpretations of our game that is on display in a confined yet accessible space and overwhelmingly the pure energy and joy that resonated in the Crown Palladium during the Gala Dinner. That was a true celebration of the spirit that exists within International AFL. WFN: Did the AFL seek feedback from the nations post-IC11? If so was the response generally positive? Any common themes? Tony Woods: Generally feedback was positive. There are always areas we can improve and will strive to do so at the next International Cup. 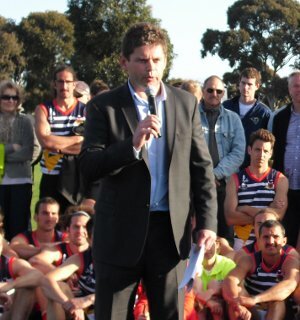 WFN: In the past the AFL has suggested the International Cup host city could be anywhere in the world, and although it has been co-hosted (e.g. Sydney this time), Melbourne has always featured prominently. Do you expect this to continue for the next International Cup? Can we assume 2014 is locked in as the year? Tony Woods: 2014 will be the year. The challenge with moving it around is teams see the International Cup as an opportunity to attend AFL matches. In some regards, beginning in Sydney meant that teams could not consume as much live AFL as they would have preferred however the trade-off was an opportunity to play at a high standard AFL facility in Blacktown and to play a mid-tournament curtain raiser at ANZ Stadium. WFN: How do you see the tournament progressing in future? Presumably more teams and the standard continuing to increase. Do you see a way for the crowds to grow and the event to become a bigger focus on the sporting calendar for Australians? Tony Woods: In my view we are on the right trajectory and the standard should continue to improve. As we work to elevate the profile of International AFL through our growing activity off shore, the introduction of International Combines, increased outbound tours into targeted regions and in time, a couple of international players breaking through onto AFL lists, the profile of International Football in the domestic market will rise. With this should come increased profile of IC14. We are also looking at some minor changes to the itinerary which will hopefully allow more curtain raisers played.